Never Miss a Real Food Recipe! May 24, 2018 This post may contain affiliate links. A few small tweaks to the grocery budget can save me hundreds of dollars a month. 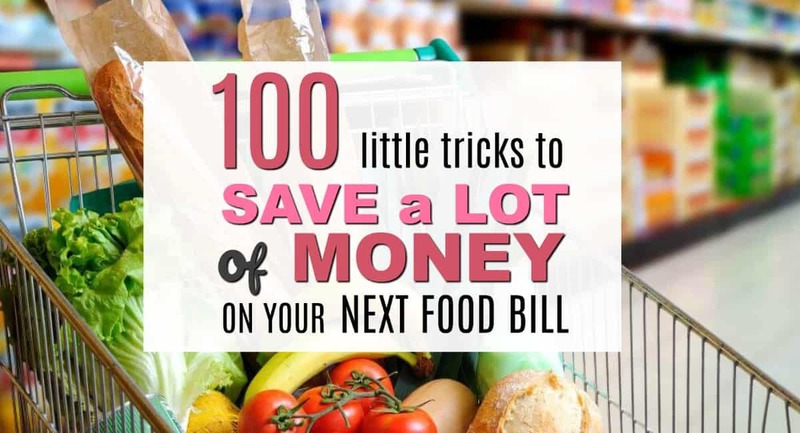 So, if money is a little tight in your home this month, then here are 100 Easy Ways to Save a whole lot of money on your next food bill and help you get back on track by stretching your income a little further. Spending money on food is often the biggest household expense after a mortgage. In our home, it’s even bigger! But it’s also the place I go to first if I want to cut our spending or squirrel away a little extra cash when those unexpected bills arrive. Like when my husband bit into a popcorn kernel and cracked his tooth last week. Boom! Unexpected dentist bill of $1000. Agh! So this week, the family is on a serious grocery budget cut (and no popcorn for hubby either because he doesn’t eat it responsibly:). Our food bill can be scary. It’s something that I have to work on ALL the time. It’s too easy to keep adding the odd item to the trolley as you wander through the supermarket. For years I didn’t even try save money on my grocery shop. I just convinced myself that ‘it was just how much it costs’ to feed our family. Pffft. Not any more baby! Now I’m a cost cutting machine. –>> If you really want to kick step up your Grocery Game, then take a look at this grocery game changer: The CEWK Meal Planning Binder. This 125+ page organizer has everything you need to get your food budget and meal planning game in check. **MY FIRST EVER IN POST COUPON ** As a little Thank you for Visiting my new store, you can get my Recipe Binder(Usually $27.00) for only $1.00(I know! Crazy right? ) BUT .. you MUST use the code RECIPEONE at checkout. Please note that this is only available for a limited time while I’m learning how to set up my Shopify Store :). The Store is still in development so some links may not be working. I will be adding products and sales frequently over the next couple weeks. So check in regularly for some GREAT under construction discounts. 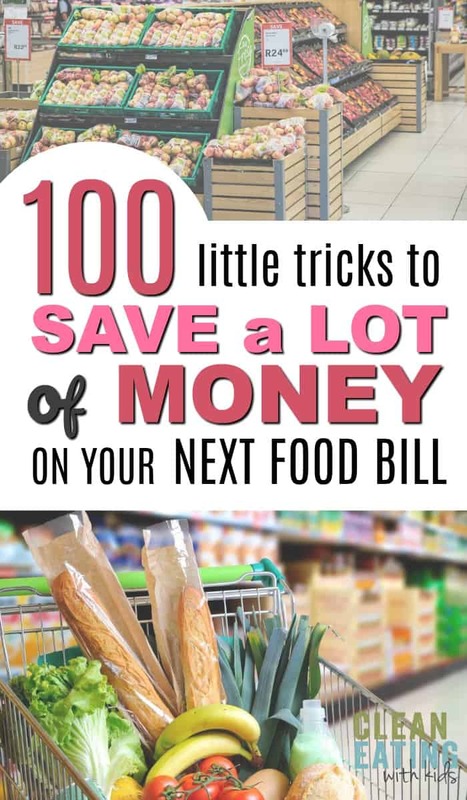 This is big list, but when it comes to saving money on groceries, every dollar can add up. Implementing even a few of these tips will save you hundreds of dollars. Let me know if you feel I’ve left anything off the list. Decide on your budget for the week so that you know how much money you are working with for the week. I include a Grocery Budget Tracker Price List & Grocery Spend Tracker in the Recipe Binder mentioned above. Don’t forget to add your Coupon Code (RECIPEONE) at Checkout to get it for $1.00. Check your pantry, fridge and freezer to see what food you have in stock and which ingredients you can use for the week. You can get my Taking Stock templates here with three templates (fridge, freezer and pantry inventories) that you can reuse over and over again. You can get my entire 125+ Page Recipe Binder (which includes these three templates for $1 – it’s only available while I work on my Store. Think of it as a renovation sale :). Check out the grocery store specials and mailers to see what’s on special. Only go to the grocery store once a week. Make a Meal plan using grocery sale items and ingredients you already have in your kitchen. Meal prep as soon as you get home from shopping so that food is allocated correctly. If you bought meat in bulk, divide it up in portions, cut up vegetables and freeze. Shop with a grocery list to avoid impulse purchases. Buy Generic brands. Often the budget brands are just as good as the leading brands. Don’t pay more if your don’t have to. Leave the kids at home when you go shopping. If you have to take them with you, then learn to say NO. Don’t shop when you’re hungry. Don’t shop last minute. Yup. That ‘quick’ trip to the store will add up the costs every week. Don’t shop when you are upset or angry or stressed. Many of us resort to food as a comforter and it’s tempting to buy convenience foods to lift the mood. Your waist and your budget will thank you. Look out for specials, coupons, mark downs and bargains like it’s your job. Ask the store attendants what days or times they do markdowns every day so you can shop then. Visit your local farmers market. Keep a little cash in the car and stop at roadside stands. Speaking of cash … use cash to buy your groceries and leave your cards at home. It will stop you overspending. Sign up for store rewards. Buy in bulk BUT only if it’s cheaper. Work out (you are welcome to use a calculator) to calculate the price / unit. Make a Master Price List of ingredients you buy regularly so you learn to recognize when a product is on special. Keep track of things that are running low with a Master List of Ingredients. This can be a simple notepad stuck to the fridge. Everyone in the family simply writes down the ingredient that is running low. That way you don’t end up buying more than you need. Avoid individually bagged items or mini versions of things. Cut your own cheese, bag your own popcorn and spoon your own yogurt into a little pot (I use these for my kids lunches) at home. Learn to make things from scratch like cakes, biscuits and muesli bars. Learn to make your own bread. If something is on sale for $8 for 3 but you only need one, then don’t spend more unless you know you will be using it. A sale is not a reason to blow your budget. Never, ever buy bottled water. It’s expensive and the plastic bottles are not good for the environment. Get a reusable water bottle and fill it from the tap. We use these ones in our home. Everyone has their own color and they are over two years old and still work like a charm. Things tend to go on sale at the same time every year. Meal plan around what’s on special this season. Stores also have a few items that are super cheap to get people into the store. Keep an eye out for these products and stock up if they are something that you use. Ask if your store will match their competitors coupons. Decide on snacks that are OK for the week and put them in a snack box to avoid impulse purchases. Things ti include in your snack box are home baking, popcorn and fruit. Stick your meal plan where everyone can see it so the family knows what they are allowed to eat at each meal. This avoids kids snacking on ingredients you were going to use for a recipe. Bulk up meals using budget foods like potato, beans and vegetables. Limit the amount of meat you use in a recipe as meat is often the most expensive ingredient in a dish. Gather a list of budget recipes you can make for the family. Erin from $5 Dinners has an insane range of cheap $5 dinner options in her Grocery Makeover Course. Make a meal using Bottled Pasta Sauce. There are some fantastic., good quality options available at most stores. Here are 14 Healthy Meals to make with a Jar of Pasta Sauce. Make lunch at home and take it to work or school in a reusable lunchbox. Get a lunch box with little compartments to save money on lunch wrappings. We use these ones and they are brilliant! Cook one meal. Don’t make variations for fussy eaters. Cook once. Eat twice. Make extra when possible so that you can freeze a serving for another nights dinner. Casseroles, soups, pastas are perfect for this. Eat wholegrain foods as they are more fulling and better for you. Serve salads or rice with a meal to bulk it up. Don’t eat out. Rather get creative with entertainment. Go on a picnic, have a pot luck dinner with friends, let the kids cook dinner. Here are some more money saving ideas on for No Spend Weekend with the kids. Get to know how long things can safely be kept in the refrigerator so you can either use them or freeze them to avoid wastage. Get serious about reducing food waste. Pack away leftovers. Freeze bread crusts to make breadcrumbs later. Freeze ends of vegetables and when you have a big enough bag, make your own vegetable stock. Serve smaller portions to your kids. Check here to see what portion sizes you should be feeding your kids. Buy whole chickens instead of precut, deboned chicken pieces. Look in the freezer section for your meat. Buy frozen vegetables. They are often cheaper and are just as good as the fresh stuff as they are frozen soon after picking. You don’t need all the extra equipment in your kitchen. Keep the basics, sell the stuff you haven’t used for a while. Use the internet to find recipes for ingredients you already have. I bet you will find one for just about any ingredient combination. Don’t serve dessert every night. Once or twice a week is plenty. Stop buying fruit juice and soda. Drink water. If water doesn’t excite you, then try some water infusion recipes. Use ground beef in your recipes instead of more expensive beef cuts. Take a look at these brilliant, budget ground beef recipe ideas. Variety is overrated. You don’t have to offer a ton of choices. Stock one or two fruit types for snacks. Make one or two biscuit recipes for the week. It’s OK to eat the same meal twice in a week. Get creative with it. If you make a chicken casserole one night, use leftovers for toasted sandwiches or slap a crust on it for a homemade chicken pie tomorrow night. Use your slow cooker. It’s a great way to tenderize cheaper meat cuts and you can cook enough for two tasty meals in one go. If you are making a roast chicken, cook two at the same time. The extra one can be shredded and refrigerated for meals during the week. Pasta meals are easy, cheap and a small bag of pasta makes a huge meal. Choose wholewheat pasta for a healthier option. Grow your own herbs in a pot on your porch or on the window sill. Consider planting a vegetable patch. Start by choosing two or three easy to grow vegetables like lettuce and tomatoes. This way, you can get a salad on the table for under $1. Zucchini is surprisingly easy to grow. Make your own salad dressings with a few simple ingredients. Stop buying deli meats. Use shredded chicken I mentioned in Tip No. 60. Make your own spice combinations by combining the basic ingredients rather than buying the done for you options. Freeze super ripe bananas. They are perfect for smoothies or a healthy ice cream option. Get to know the best way to store food. For example, Apples ripen 6 to 10 times faster at room temperature so they should be stored in container or vegetable crisper in the fridge to prolong their life. Make your own ‘Junk food’ at home. Try this Unbelievable two ingredient pizza crust for pizza night at home. Stop Buying those sweet and nasty kids breakfast cereals. Make your own granola. It’s cheap and good for you. Creamy Oats are a fantastic warm and budget friendly breakfast during Winter. Milk about to expire? Freeze it and thaw it out to use later. adding a little butter to the edge of semi-hard cheese keeps it from drying out. Change recipes to cut costs. Nobody will sue you if you alter your recipes a little to suit your budget. You can substitute cheaper veggies or cuts of meat rather than using the more expensive ones. Re-purpose your vegetables. Save the inner cloves from fresh garlic and plant them in 1/2 inch deep soil in a pot. In around six months, you’ll be harvesting your own garlic! Other foods that can be regrown from roots and scraps are celery, roman lettuce, pineapple and leeks. Invest in some decent reusable food storage to prevent food waste. Store opened goods correctly to avoid it spoiling. Refill our condiments from larger bottles. Rather than buying small jars every week, buy one bulk jar and refill the smaller one. Keep yourself motivated. Keep track of the money you spend and save at the grocery store. Put the savings into an account and watch it grow. Use canned fish. Just like their fresh counterparts, canned salmon and tuna provide omega-3 fats, which help keep your heart healthy. The difference is that they’re usually a whole lot cheaper. If you are concerned about the Organic’ness of your fruits and vegetables, then save money by sticking to the Dirty Dozen/Clean Fifteen list. Stir fries are cheap, quick and easy and you can bulk them up with a side of rice or extra cabbage. End of the week pantry looking a little bare? Instead of popping out to the shops try having a ‘Pantry Challenge’. Get the family involved and make a meal from what you have in stock. You might be surprised at what you manage to pull together. This one little trick saves us around $50 a month. Make your own french fries. Peel and slice potatoes, sprinkle with salt and bake for 20-25 minutes until crispy. To speed things along, you can par boil the fries and freeze so that you have your own ‘just pop in the oven’ homemade french fries. Keep things really, really simple. We don’t eat a huge variety of foods, but we eat well and get lots of veggies in our diet. The key to lowering your grocery bill is to eat cheaper items, more often. You can make a huge variety of meals with a few basic real food ingredients. Consider having breakfast for dinner. Nothing wrong with an omelette or egg and homemade baked beans on toast for dinner. Learn to substitute ingredients or swap out foods if you don’t have an ingredient. It means that you won’t have to buy two ingredients that do the same job. Here are 31 Clean Eating Food Swaps to get your started. Ditch the Guilt Game. Don’t feel as if you need to blow your budget because you feel guilty. This can be about anything – feeling guilty for feeding your family the same meal three nights this week, or saying No to their favorite snacks. As Moms we play the guilt game way too often. Loaded Sandwiches. I have to mention this one because my family loves these dinners. I toast some wholewheat bread and then load them up with anything we can find and top with grated cheese, before popping them in the oven to grill. It’s a slightly out the box, super yum and cheap dinner! Buy whole foods. For example, a block of cheese is cheaper than shredded cheese and dried beans are cheaper than canned beans. Whole grains, like brown rice and oats are also cheaper per serving than most processed cereals. The less processed foods are also often sold in larger quantities, and you get more servings per package. Stop buying junk food. By skipping the processed and unhealthy foods, you can spend more of your budget on higher quality, healthy foods. Keep your kitchen and pantry well organised to avoid food expiring or doubling up on things you already have. Make meals matter. Set the table, get out the napkins and make the meal about each other not just food. This makes even the plainest meal special. Be flexible. Be willing to adjust your meal plan based on what is on sale in the store or what you have on stock. Remember, do the best you can. But don’t stress if everything isn’t perfect all the time. Subscribe to get our newsletter and get two new (Kid Approved) Clean Eating recipes sent to you each week. Copyright ©2019, Clean Eating with kids. All Rights Reserved.